UCTC Presents All Sizes Fit Week! February 2014! 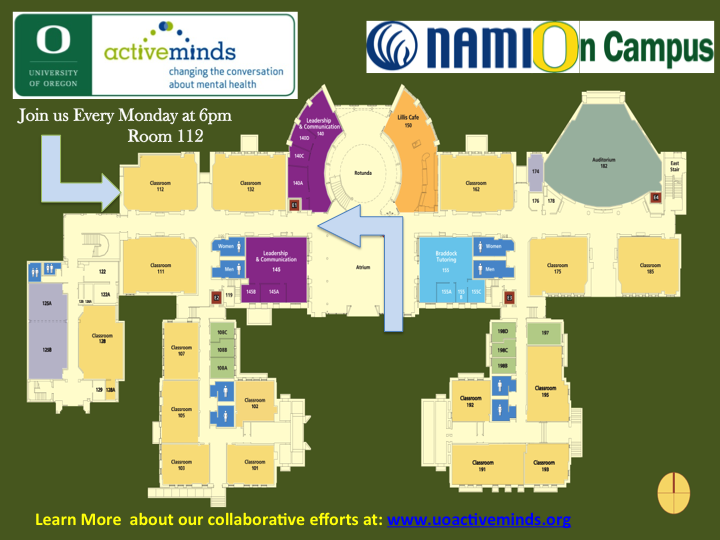 Every Monday in Lillis Room 112 at 6 p.m.
Join UOAM as we welcome our new partner organization NAMI On Campus. Light refreshments will be provided on a limited basis. Learn what we are going to do, learn what NAMI On campus will be doing! Join us for NAMI’s first meeting, and UOAM announcements. Join us today at 6PM in Lillis 112 for our second general meeting of the term! As we plan our earth faire participation and how we will contribute to Take back the night! Then stay for NAMI On campus peer support group. We will be tabling from 330 p.m to 6 p.m. then stay for the event as we stay in support of Take Back the Night presented by the Women’s Center. 3 p.m. to 9 p.m.
Join us today at 6PM in Lillis 112 for our third general meeting of the term! As we plan our participation if the Street Faire! Then stay for NAMI On campus peer support group. Join us today at 6PM in Lillis 112 for our fourth general meeting of the term! As we plan our ASUO street Faire! Then stay for NAMI On campus peer support group. Join us today at 6PM in Lillis 112 for our fifth general meeting of the term! As we plan our ID Campaign and our biggest event of the term! I stand with 1 in 4 on May 28! * UO Active Minds will need members to help us perform some outreach programing a 1-2 hour commitment recommended. * UO Active Minds will need members to help us perform some outreach programing. A 1-2 hour commitment preferred. Are you part of another organization or have an idea on what we should focus on, would you like a co-joint meeting with UO Active Minds, or just have some comments? Then Send us an email and let us know, we would love to hear from you. activeminds@uoregon.edu. UOAM is currently not fully funded by the ASUO or other departments our budgets fluctuate from term to term and we depend on your generosity to continue our mission on campus.